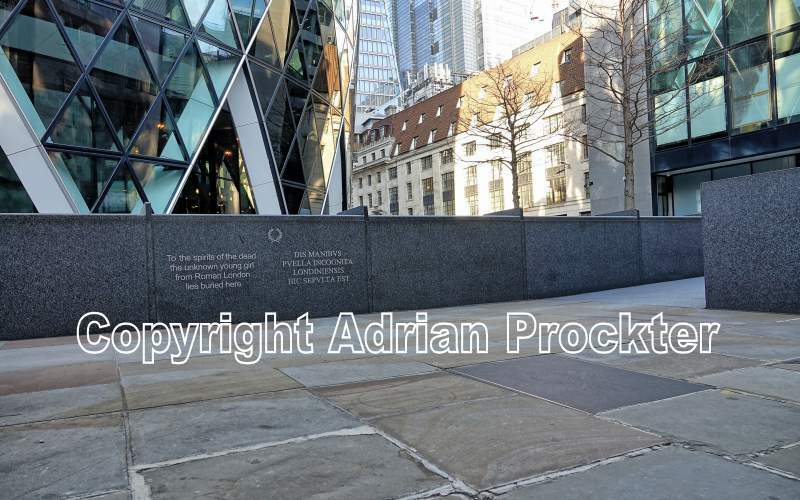 Above: Modern stone marking the site of the reburial of the girl found near the site of the Gherkin. Of recent years there have been three finds of Roman skeletons discovered – one within the area of Spitalfields, one in the City of London and a third in Southwark. Much to the surprise of the archaeologists, all three burials revealed that the person buried was female. Two of them had evidence that they were people of high status because they were buried in a stone sarcophagus. Before the finds were made, only two intact lead and stone coffins had ever been found in London, both in the 19th century. The Spitalfields tomb was discovered in 1999. The stone sarcophagus was carefully removed from the ground and conveyed to the Museum of London before being opened. It is on display within the museum. After forensic research on the remains, a reconstructed head was made in clay, using the dimensions of the skull, and that is also on show. The burial site at Spitalfields was not a particular surprise because, in Roman times, burial sites were usually outside the boundary of a Roman township and this site was outside the Roman Wall as well as being to the east of the Roman road running north from Bishopsgate. A second find of a sarcophagus was made in Southwark in 2017. The site was near Harper Road, at the junction with Swan Street. Unfortunately the grave had been robbed in earlier centuries. While the burial site in Southwark was unexpected, it was outside the known Roman settlement around what is now Borough High Street. The burial site was also some distance from the known route of the Roman road that led from Londinium to Canterbury – which later became known as the old A2. 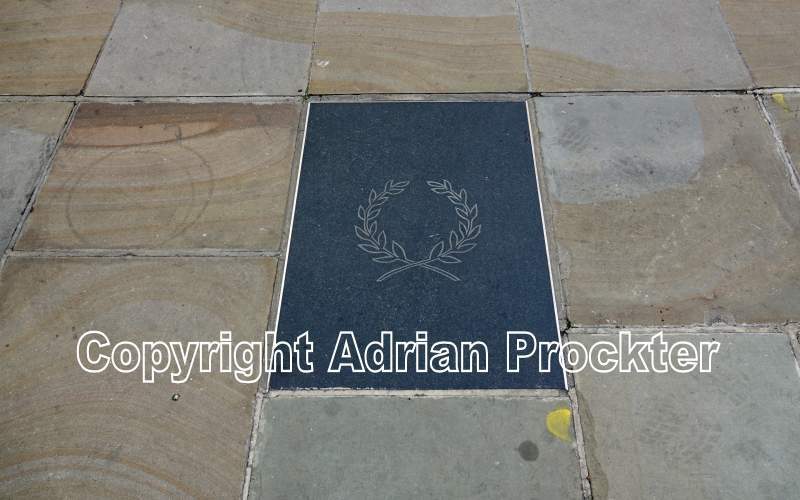 Above: The stone marking the girl’s resting place is beside Bury Street. There is an inscription on the wall around the Gherkin simple stating ‘To the spirits of the dead the unknown young girl from Roman London lies buried here’. The third find was that of a girl’s skeleton, discovered in 1995. The remains showed that she was lying on her back with her arms crossed across her chest. The skeleton was found when the Swiss Re building, called 30 St Mary Axe but better known as the Gherkin, was being built. The girl was believed to be aged between 13 and 17. She was buried in keeping with the Roman traditions between AD 350 and 400. For the next 12 years, the remains of her body were stored at the Museum of London, after its discovery during an excavation. When the Gherkin had been completed, the girl’s body was re-buried where it had been found – near the base of the building. Prior to burial, a service was held for the girl at the church of St Botolph, Aldgate. In the case of the skeleton found on the Gherkin site, there were no archaeological clues as to the origins of the girl. Although buried at a time when Londinium was in existence, it was not certain whether she was a Roman citizen, a slave-girl or even a visitor from some other part of England or much further away. To find a Roman burial near the present site of the Gherkin was more unusual because the burial had been carried out within the boundary of Londinium although, by the 4th century, the Roman occupation had substantially declined from its peak in the 1st or 2nd centuries. This entry was posted in /City-Aldgate. Bookmark the permalink.